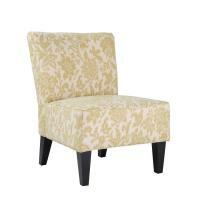 An armless chair is a perfect solution for any space needing extra seating. The transitional shape will blend well with any decor. A bold design on the fabric will provide that special something that will add interest to any room. 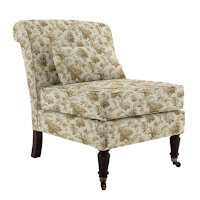 The designer chair on the bottom features a light armless silhouette, a plush seat and a fabric with a large flowered pattern. It is sold by a leading internet retailer for $615. The striking chair on the top also features a sleek armless shape with a plush seat and a fabric with an elegant floral design. The armless chair on the top is available at CheapChicDecor.com for only $349. Why pay more for the same look? Careful shopping will allow you to achieve the design you are after at a more affordable price. To see more great “looks for less” visit http://www.cheapchicdecor.com/.